Need a fine arts event?? 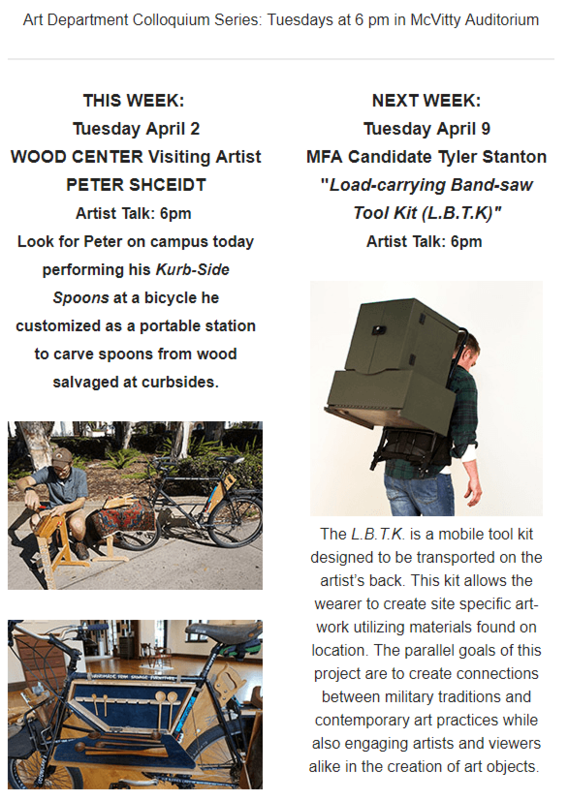 Attend “Inside the Writers Studio”, which will be in HSS 220 at 4:00 pm on Wednesday, April 24 as part of the English Department’s “Faculty Spotlight” series of talks by English faculty members. It will be a talk about method acting, the approach to psychologically realistic acting formalized by Konstantin Stanislavski, and how an understanding of some of the principles behind “the method” can also help a person *write* more creatively and authentically in any situation. If you are interested in working Into the Streets on Saturday, contact Anyone can contact Matthew Cellucci at 717-688-4413 for more info!! The Physics Department needs some help with their 2019 Physics Olympics event on Friday, April 5th. Please help out if you can. 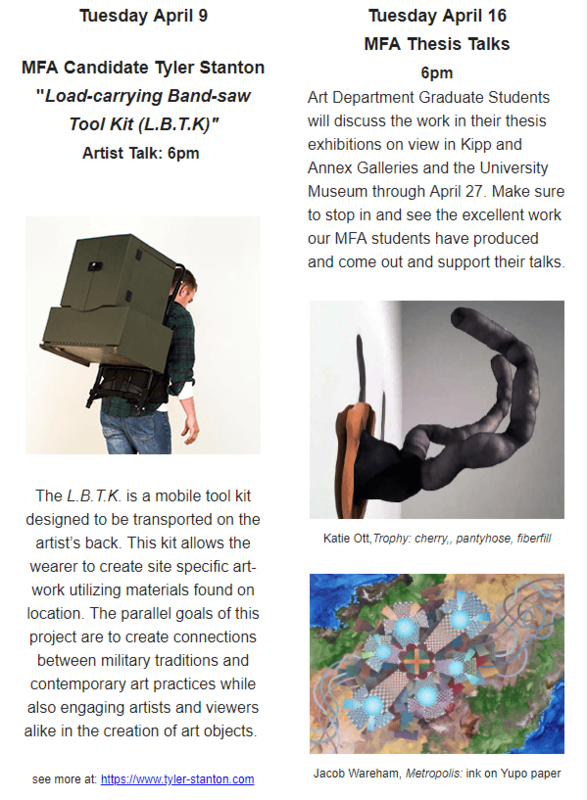 The event will take place in Weyandt Hall, Room 340. The event will be running from 8:00am to 2:00pm. You’ll have the chance to judge events, talk to prospective IUP students about your experiences, and get a free pizza lunch. We understand that not everyone can miss class to work the whole event but if you’re able to work a portion of it that would be a great help! 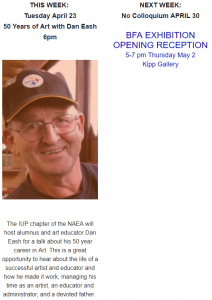 Stop by Weyandt Hall or contact Mr. Michael Joos at M.A.Joos@iup.edu if you can help out. Honors College E-Board is hosting its annual Nerd Saturday April 6th at 8 PM in the Great Hall. Picture this: its 2010 the Jonas Brothers is playing on your iPod nano, you just liked you BFFs “like for a TBH Facebook post”, and sigh dreaming of your seniorprom. Well grab your mismatched socks and converses kids, because the Middle School dance themed event of your dreams is coming this Saturday. This is a totally free event with all your favorite middle school snacks and songs. Recreate your coolest middle school looks or wear a semi formal fit (or show up in whatever and say “I got this shirt in middle school and I’m just here for snacks anyways”). IUP’s Colleges Against Cancer is having an event on April 17th at 9 pm in the Oak Grove. It is called A Night of Hope. It is a fundraiser for the American Cancer Society Relay for Life. A Night of Hope is in memory and in honor of those who have battled cancer. There will be food, games, and activities before and throughout the event, along with a luminaria ceremony. All are welcome to attend. 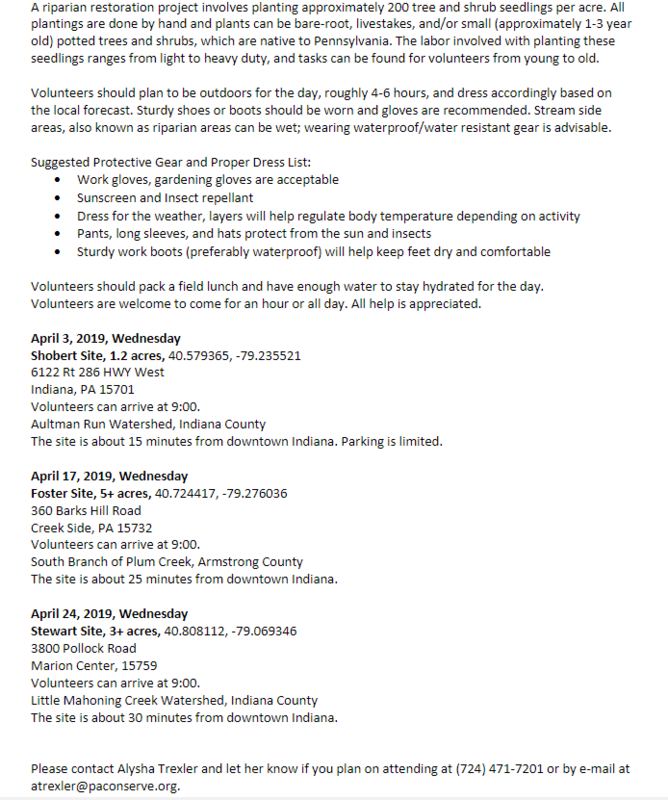 They are in need of volunteers to help set up, staff the event, and tear down at the end of the event. 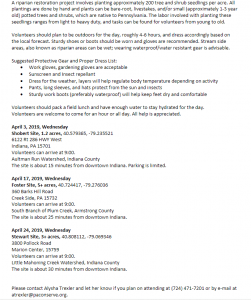 Students would receive service hours for participating and volunteering for our event. 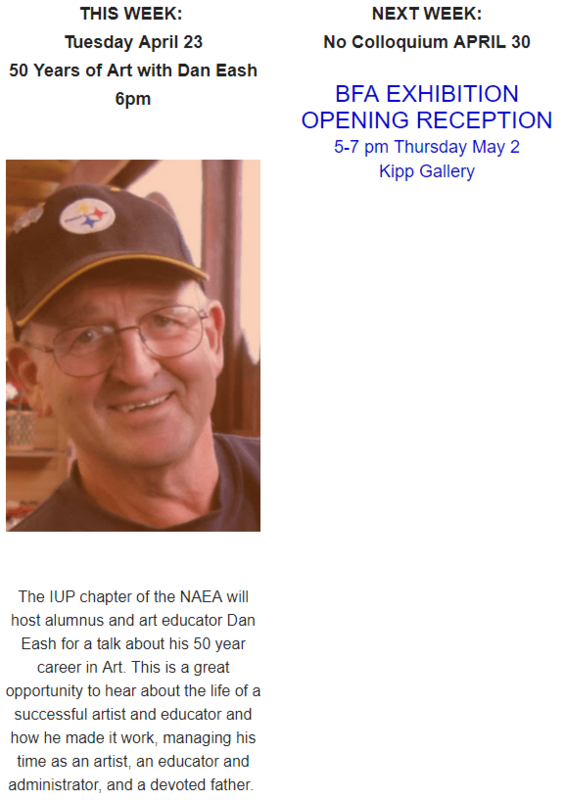 Any questions about the event or interest in helping with the event should be directed to kwzw@iup.edu. 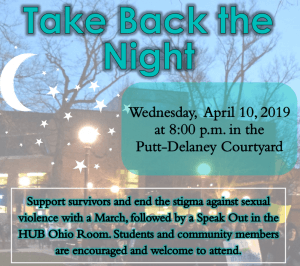 Take Back the Night, an annual march and speak-out in support of victims and survivors of sexual violence, is next Wednesday, April 10th at 8:00pm in the Putt-Delaney Courtyard. The Haven Project invites you to join us in demonstrating support and solidarity with victims and survivors. Free t-shirts will be distributed beginning at 7:15pm in the Putt-Delaney Courtyard. At 8:00pm, we will march through campus to the HUB. 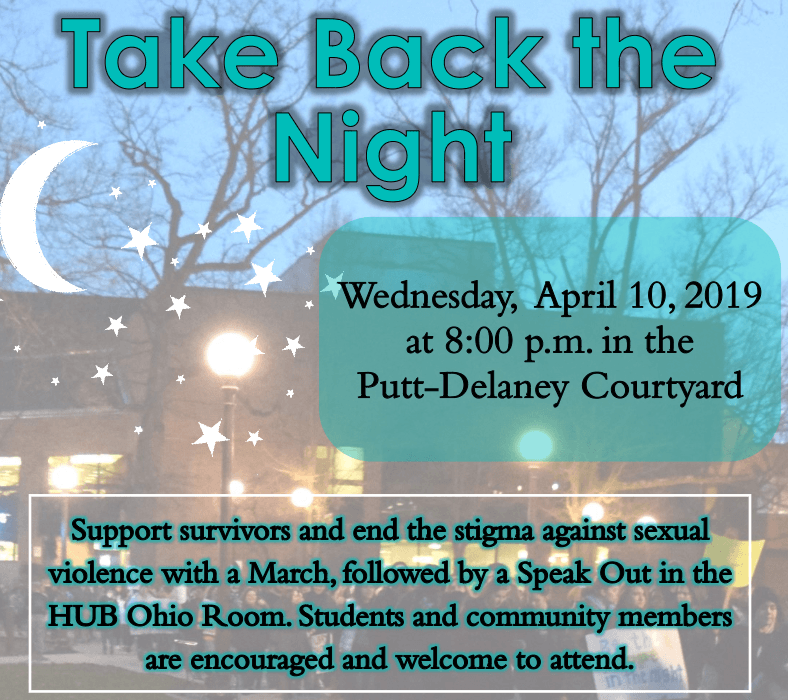 At 8:45pm in the HUB Ohio Room, victims and survivors will be welcomed to speak in a safe and supportive space. All students, faculty, staff, and community members are welcome. There will be attendance vouchers available at the speak-out for students. Please invite your students and anyone that you think may be interested in this event. Emotional support staff, therapy dogs, and refreshments will be available. On Tuesday, April 9th from 4:00pm-7:00pm, anyone who is interested may also meet the Haven Project in the Oak Grove for Chalk the Walk, during which we will chalk statistics and supportive messages around campus in preparation for Take Back the Night. Finally, tomorrow, Tuesday, April 2nd from 5:00pm-7:00pm, the Haven Project is hosting a Clothesline Project workshop in room G-18 of Suites on Maple East. The Clothesline Project uses t-shirts as an educational art form to inform students and the community that violence is a problem everywhere, help is available, and there is hope and a path to healing. At this workshop, victims and survivors can make a t-shirt that will be anonymously displayed as part of Haven Project’s Take Back the Night. Anyone making a shirt is welcome to bring friends or loved ones along for support, but we ask that only those directly affected by violence make a shirt. Fine Arts Event!! This Saturday (3/30) at 7:00 in Fisher is an awesome event you don’t want to miss, Cindi: An Evening of Dance and Percussion! This show is a new take on the classic story of Cinderella. This show also features multiple honors college students. 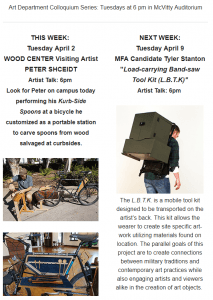 Come support your dancer/percussionist colleagues (and attend one of the five fine arts events you need)! You won’t regret it! !